Local Corporation provides digital marketing solutions that link local merchants with online consumers. The Company generates revenues primarily through an ad-supported model. In the second quarter 2012, 79% of sales stemmed from pay-per-click advertising, 9% from subscriptions (direct customers), and 12% from display ads. Over the past five years, the firm has grown from a single website (www.local.com) to an online media business powering multiple proprietary websites (e.g., www.krillion.com and www.spreebird.com) and approximately 1,200 regional media sites. In 2011, the Company expanded and diversified via several strategic acquisitions while deploying new features and functionalities for its existing channels. Local Corporation has expertise in helping small businesses develop and maintain a sophisticated online presence in order to be easily found by consumers, both on their own web properties and on major search engines. Its platform includes rich media ad creative, local business directory and product search technologies, mobile capabilities, search engine optimization (SEO), web hosting, social media services, daily deals, and a loyalty/rewards program, among other products and services. 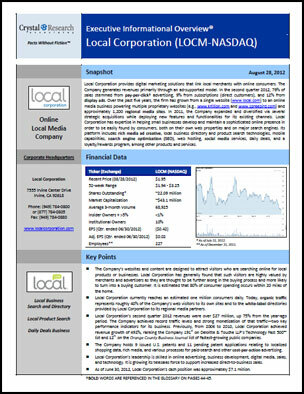 * The Corporate Snapshot was last updated on August 28, 2012.